Like when you think, really hard, about what you want, and realize your daily life would be easier with a new vacuum. Yeah. But yes, I would love a new Dyson vacuum. The multi-floor one looks cool, as we have hardwood and carpet on the first level, and will be switching it all to hardwood eventually (but will then, I'm sure, still have rugs). We also have one cat, but she's old and tends to shed in clumps. So the hair isn't a big issue for me, and she won't be around forever. I've been really happy with our general Dyson from way back when. It's purple, so I think it's the animal version from years ago. The big ball looks cool - is it? 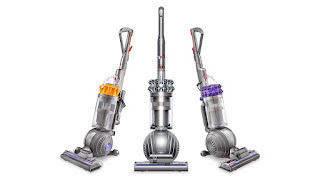 If you have a vacuum you love, let me know about it! I'm hoping Santa will bring me a new one.